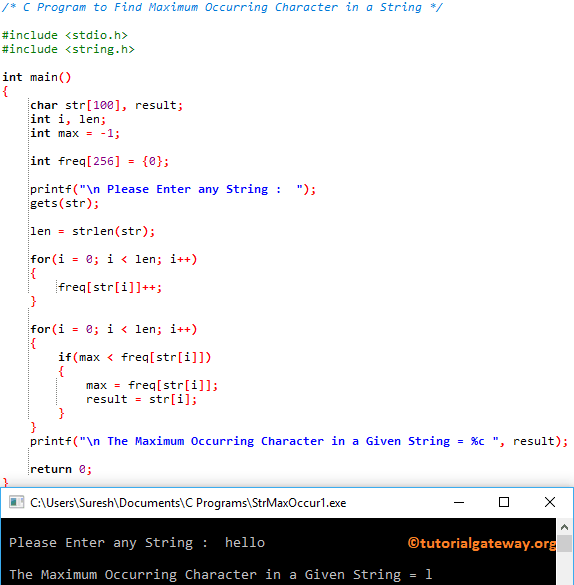 In this article, we will show you, How to write a C Program to Find Maximum Occurring Character in a String with example. This program allows the user to enter a string (or character array). Next, it will find the maximum occurring character (most repeated character) inside a string. Next, we used For Loop to iterate each and every character in a String, and find the maximum repeated character. The condition is True because 0 < 5. This program is same as above, but we did small changes to the logic. This program is same as second example, but this time we used the Functions concept to separate the logic.